To make the baked or fried whole chicken looked nice on the festive table, you need to decorate it. You can use fresh vegetables, fruits, garnish. You can make decorations out of paper – curlers. Use for decorating chicken the same products that are included in the meal. For example, a bird stuffed with mushrooms, garnish with mushroom caps, laid out in a circle. Decorate the fried chicken with a grid of mayonnaise or ketchup. Can instead of a grid to draw curls or even make the inscription. 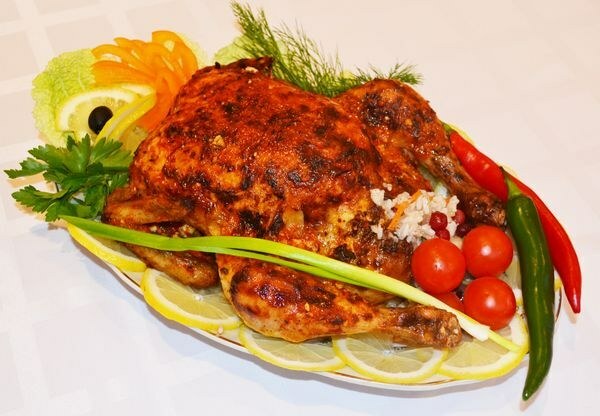 Place the dish of chicken with side dish. Cut the potatoes in big pieces, boil them until soft, and then fry in boiling butter. Place the chicken on a large plate, and around it lay the potatoes. Add greens, it is suitable for any dish from chicken. Slice cucumbers in rings, tomatoes cut in half, lay them in the dish around the chicken. Cucumber can also be cut into long thin strips. Roll each of them in half and tightly lay at the edge of the serving dish to get a beautiful wavy border. You can put olives - whole or cut into rings. Make tomato roses. Select ripe tomato and cut with a sharp knife the peel so that she was making a long strip. Need to move from the base of the tomato to the stalk. The resulting spiral will tighten and form a rosette. For decoration instead of vegetables you can use fruit: chicken goes well with citrus (lime, lemon, orange), which should be cut into rings and spread on the greens. Make for decoration fried chicken curlers. Take plain white paper, cut the strips the full length of leaf, width 8 cm, Fold them in half lengthwise. Cut notches with scissors from the fold with an interval of 0.5-0.7 centimeters, not dorezaya to the edge of 1-1,5 cm. It is desirable to make markings on the workpiece so that the curlers turned out neat. The obtained fringe adorn the legs of a chicken. Conn edge of the paper shoes a glue of flour or starch.